Adventure Dining Guide's Michell Shea cooks chocolate tapioca pudding for dessert during her pop-up cooking event on Wednesday, July 20. 4. On the trail open the bags - use pickled slaw as a topping or eat plain for a refreshing treat. Drink the pickling juice straight or mix with water. 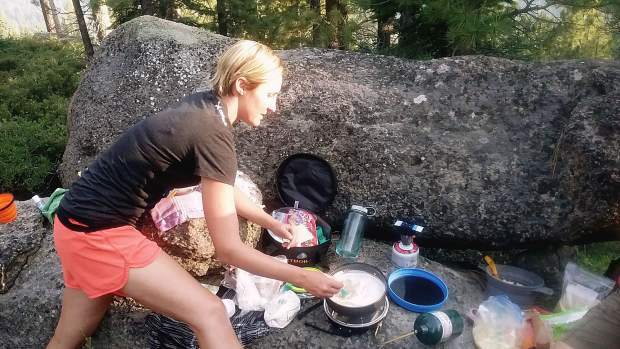 Adventure Dining Guide’s owner Michelle Shea has made it her mission to bring culinary expertise to the outdoors by spreading the word about easy-to-make backcountry meals. Filling her pack with lightweight ingredients and cooking equipment, Shea can hike in enough food to feed roughly 10 people, while miles from civilization. Since creating her outdoor cooking website, adventurediningguide.com, Shea has hosted a few cooking events around the area where she takes guests out on a hike, and then shows them how to prepare meals in the wilderness. After partnering with Tahoe City’s Alpenglow Sports for an event during the Summer Mountain Festival, Shea has branched out on her own. She hosted the first of her summer pop-up cooking events on Wednesday, July 19, where participants met her on a hike to upper Dollar Creek for pulled pork sliders, a version of macaroni and cheese made with couscous, and a dessert of chocolate tapioca pudding. Shea was inspired to start Adventure Dining Guide after her time as a professional snowboarder. While globetrotting to different countries for competitions, she said seeing different cultures and their eating styles prompted her to put away the trail bars and packages of ramen noodles in favor of something a little more extravagant. After putting together dozens of easy-to-cook backcountry recipes on her website, Shea began hosting pop-up cooking demonstrations to spread the word about outdoor dining. Using a single-burner Jetboil stove, she began the meal by boiling water from nearby Dollar Creek, and then added in couscous, powdered milk, and olive oil. Keeping ingredients from spoiling provides a huge benefit, which is why another of Shea’s backcountry staples is pickled coleslaw. For the main course of the pop-up dining event Shea whipped up pulled pork sliders on flat bread. Using pork sung — a dehydrated pork product — she added water, a dash of barbecue sauce and seasoning, quickly cooking up the food on the Jetboil for a lightweight meal that could easily feed a handful of people. The evening was capped off by making chocolate tapioca pudding on the Jetboil stove, and then letting it cool and thicken in the high mountain air for a tasty dessert.